Phill Hopkins was born and raised in Bristol, UK. He studied sculpture at Goldsmiths College, London and was taught by Michael Craig-Martin, Carl Plackman, and Richard Wentworth. Whilst at Goldsmiths, Hopkins was included in the ‘New Contemporaries’ show at the ICA, London. After graduating from Goldsmiths in 1985, Hopkins was chosen to exhibit in the ‘Whitworth Young Contemporaries’, Whitworth Art Gallery, Manchester, UK. The same year, he relocated to Leeds, UK. In 1987, Hopkins was one of the three major prizewinners of the ‘Showcase Summer '87’ at the Elizabethan Gallery, Wakefield, UK. In 1988, St. Paul’s Gallery in Leeds showed ‘The Little Naturalist’; a collection of his welded steel sculptures. In 1989, Hopkins curated ‘Exchanges’ at the Kunstlerhaus in Dortmund, Germany, which included some of the work from the ‘Little Naturalist’. In 1991, Leeds City Art Gallery staged Hopkins' first major solo exhibition, ‘Flyers - Recent Drawings and Sculpture’. The gallery consequently acquired Hopkins' work for their permanent collection, along with acquisitions by the Henry Moore Centre for the study of Sculpture, the Imperial War Museum, London and many private collections including that of Dr Jeffrey Sherwin. In 1993, at Kettle's Yard, Cambridge, UK, the curator Charles Esche, included Hopkins' sculpture in ‘Declarations of War: Contemporary Art from The Imperial War Museum’. From 1993-1995, Hopkins' work was included in ‘Four Centuries of Sculptors' Drawings from the Collection of Leeds City Art Galleries from Mistodrzitelsky Palace, Moravska Galerie and Bruno, Czechoslovakia. Hopkins was also included in ‘Sculptors' Drawings’ - Cornerhouse, Manchester UK, and ‘Sculptors' Drawings’ at John Hansard Gallery, Southampton, UK. In 2003, to celebrate the 10th anniversary of the Henry Moore Institute in Leeds, Hopkins' work was included in their ‘Other Criteria’ show. For a period Hopkins concentrated on workshops and educational projects, and then in 2008 Greenbelt Festival presented 'Seven Drunken Nights’, an exhibition of innovative drawings, sculpture and a striking performance piece. In 2012, Hopkins was included in ‘Vollendet - Unvollendet’ at Galerie Pack of Patches, Jena, Germany and has consequently shown with the gallery at Galerie Root, Berlin. In 2013, the artist, Becky Beasley, included a work by Hopkins in her show ‘I fall to Pieces’, which was named after the eponymous title of his piece, at Leeds City Art Gallery. 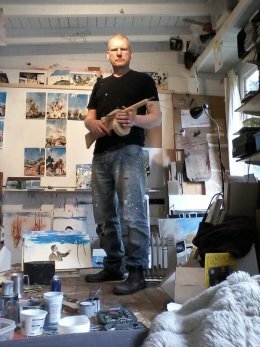 Since 2012, Hopkins has shown consistently with BasementArtsProject: firstly at 'Supermarket', Stockholm Art Fair, Sweden, and then in 'INHOSPITABLE 1.1' at 64 Wellington Street, Leeds; 'INHOSPITABLE' at Independents Liverpool Biennial; and 'COLONIZE' at 3rd on 3rd Gallery & Dykeman-Young Gallery, Jamestown, New York, USA. In 2015, Hopkins presented ‘Daily’ at BasementArtsProject base in Leeds. This included his 'Daily' newspaper publication as part of ‘About Time’ which was a satellite programme coinciding with British Art Show 8. In 2015, Hopkins represented the UK in ‘A Beautiful New World’ at the 2nd Nanjing International Art Festival, China. Following this show, 6 of Hopkins' paintings were acquired for the exhibition’s sponsor’s collection. The following year, 108 Fine Art staged a large exhibition of over 100 of Hopkins' drawings, paintings and sculpture at their Harrogate Gallery. During 2017 Hopkins was included in Expo d'anniversaire 5/5/5 at Galerie Youn, Montreal, Canada and was represented by BasementArtsProject at Sluice Art Fair, London. He continued his association with the curator Si Smith, when he was included in World Turned Upside Down at St Edmunds Church, Leeds, UK. He was included in Land / Line /Sea, when the Australian Cross Gallery took up residence at Artlacuna in London, UK. In January 2018 he again showed with Cross Gallery, this time in Australia, in 'The London Works'. He showed a series of drawings that he made in the aftermath of The Fukushima Daiichi nuclear disaster in 2011. On 1 February X opened at Left Bank, Leeds UK. A ten year retrospective curated by Si Smith, featuring over 100 works including drawings, paintings, photographs, prints, constructions and collages, that showcases an unravelling of narratives from news stories and the political climate. To accompany X a zine was published which contains two essays on Hopkins; 'Working from Home' by Si Smith and 'Context is King' by Bruce Davies. Hopkins began 2019 by being included in ‘Carl Plackman and His Circle’ at Pangolin Gallery, London. He exhibited ‘The Giantess and The Tower Block’ alongside artists including, Damien Hirst, Richard Wentworth, Alison Wilding, Phyllida Barlow, Tony Carter, Jonathan Callan, Brian Catling and works by Carl Plackman. Hopkins is currently developing an installation piece entitled, 'A House Within A Home', that will be shown in the summer at BasementArtsProject, Leeds, UK, as part of 'On The Corner' / Index / Yorkshire Sculpture International.